Ruslan Olegovich Ponomariov (Ukrainian: Русла́н Оле́гович Пономарьо́в, Ruslan Olehovych Ponomar'ov; Russian: Русла́н Оле́гович Пономарёв; born 11 October 1983) is a Ukrainian chess player and FIDE World Chess Champion between 2002 and 2004. He was also the runner-up in the Chess World Cup 2005 and Chess World Cup 2009, while reaching the semi-finals in 2011 and the quarterfinals in 2007. Ponomariov was born in Horlivka in Ukraine. He was taught to play chess by his father at the age of 5. At 9 he became a first category player, and in September 1993 he moved to Kramatorsk. Here Ponomariov attended the A. V. Momot Chess School and was trained by Boris Ponomariov. In 1994 he placed third in the World Under-12 Championship at the age of ten. In 1996 he won the European Under-18 Championship at the age of just twelve, and the following year won the World Under-18 Championship. In 1998, at the age of fourteen, he was awarded the Grandmaster title, making him the youngest ever player at that time to hold the title. In 1999, he was a member of the Ukrainian national youth team, which won the U-16 Chess Olympiad in Artek, Ukraine. Among Ponomariov's notable later results are first place at the Donetsk Zonal tournament in 1998, 5/7 score in the European Club Cup 2000 (including a victory over then-FIDE World Champion Alexander Khalifman), joint first with 7½/9 at Torshavn 2000, 8½/11 for Ukraine in the 2001 Chess Olympiad in Istanbul, winning gold medal on board 2, and first place with 7/10 in the 2001 Governor's Cup in Kramatorsk. In 2002 he beat his fellow countryman Vassily Ivanchuk in the final of the FIDE World Chess Championship 2002 by a score of 4½/2½ to become FIDE World Champion at the age of 18, the first teenager and youngest person to ever become World Champion. In the same year he finished second in the very strong Linares tournament, behind Garry Kasparov. His result in the strong 2003 Corus tournament at Wijk aan Zee was not as good - despite having the third highest Elo rating, he finished only joint eleventh out of fourteen players with 6/13, and at Linares the same year he finished only fifth out of seven with 5½/12. There were plans for him to play a fourteen-game match against Kasparov in Yalta in September 2003, the winner of which would go on to play the winner of a match between Vladimir Kramnik and Péter Lékó as part of the so-called "Prague Agreement" to reunify the World Chess Championship (from 1993 until 2006 there were two world chess championships). However, this was called off by FIDE on the grounds that Ruslan Ponomariov failed to sign the contract in time. The latter always alleged lack of equality in the contract for both contenders. 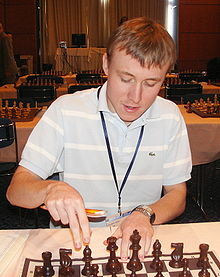 Ponomariov remained FIDE champion until Rustam Kasimdzhanov won the FIDE World Chess Championship 2004. On Ponomariov's 20th birthday, October 11, 2003, he became the first high-profile player to forfeit a game because of his mobile phone ringing during play. This happened in round one of the European Team Chess Championship in Plovdiv, Bulgaria, when Ponomariov was playing Black against Swedish GM Evgenij Agrest. In 2004, Ruslan won the gold medal at the 2004 Chess Olympiad held in Calvià, Spain, with the Ukrainian team. In 2005 he won the 15th edition of the Ciudad de Pamplona tournament. He also won a rapid tournament in Odessa, Ukraine, and the Golden Blitz Cup in Moscow. Finally, that year he reached the 2005 Chess World Cup final against Levon Aronian, who won the final. In 2006 he shared first place with Aronian and Peter Leko in the Tal Memorial tournament in Moscow. In 2009 he shared first place with Hikaru Nakamura at the Donostia Chess Festival in San Sebastian, Spain. The latter won the tie-break blitz games 2-0. Ruslan Ponomariov got one more second place by tie-break that year in the 2009 Chess World Cup, where he reached the final against Israeli Boris Gelfand. After four classic games, four rapid games, and two blitz games with a drawn score, Gelfand finally won in one last set of two blitz games. In July 2010 Ruslan Ponomariov won the prestigious Dortmund Sparkassen Chess Meeting in Dortmund, one point ahead of Lê Quang Liêm from Vietnam. In September of that year, Ukraine won the gold once more at the 2010 Chess Olympiad in Khanty-Mansiysk with players Vassily Ivanchuk, Ruslan Ponomariov, Pavel Eljanov, Zahar Efimenko, and Alexander Moiseenko. In February 2011, after occupying an unfortunate last place at the World Blitz Championship in November 2010 in Moscow, Ponomariov showed great improvement at the strong Aeroflot Blitz held in the same city by reaching second place, just half a point behind Shakhriyar Mamedyarov. In June 2011 he won the 80th Ukrainian Chess Championship, the strongest ever in the country, with 8½/11 and a rating performance of 2853. In his games with white, Ponomariov has almost always played 1.e4 (see chess opening), entering the main lines of the Ruy Lopez and Sicilian Defence. With black, he has played the Sicilian against 1.e4 and also replied 1...e5, going into the Ruy Lopez. Against 1.d4 he has adopted a variety of defences, including the Queen's Gambit Accepted, the Queen's Indian Defence and the King's Indian Defence. Earlier in his career he experimented with the Benko Gambit and Pirc Defence, but as of 2003 these have fallen out of his repertoire.